– Develop new code faster with fewer errors. – Quickly understand existing code. – Refactor existing code making it easier to read and cheaper to maintain. – Eliminate time spent searching by allowing instant navigation to any file, symbol or reference. Most features of Visual Assist X work in all Microsoft IDEs and all programming languages. Several features are available only for specific languages, typically because they do not apply in some languages. A few features implemented for Microsoft Visual C++ 6.0 are already part of Microsoft Visual Studio 2005 and .NET. Other uses of a VA Hashtag can be found with Goto (Alt+G) and Goto Related (Shift+Alt+G). Introduce Variable is available in whitespace to automatically select expressions or capture return values of method/function calls. Find References Results can be collapsed to level of project or file node via commands in the context menu of the window. VA Hashtags can be unhidden selectively. 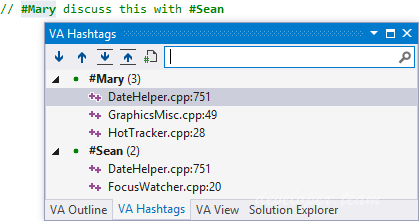 (Requires hidden tags to be shown dimmed—set in the context menu of the VA Hashtags tool window.) Persistent filter in Open-File-in-Solution dialog can be toggled with Ctrl+R. Learn more about persistent filtering. Path preference for Add Include Directive (Shift+Alt+Q) can now be specified in the options dialog of Visual Assist. Add Include Directive (Shift+Alt+Q) better places #includes when a file has an #ifndef guard. Improved code-generation for Unreal Engine 4 (UE4).